54 • August 2018 • S I G N & D I G I T A L G R A P H I C S WRAPS DIGITAL GRAPHICS Sign & Digital Graphics presents some of the industry's latest wrap projects. If you have a recent project that you would like to share, please send a sam- ple of your wrap project to Matt Dixon at mdixon@nbm.com. 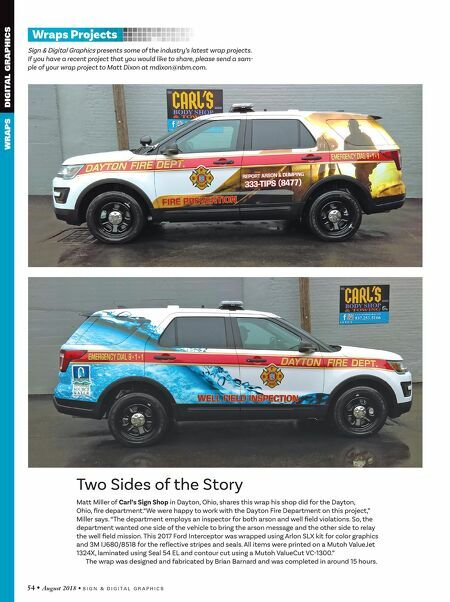 Wraps Projects Two Sides of the Story Matt Miller of Carl's Sign Shop in Dayton, Ohio, shares this wrap his shop did for the Dayton, Ohio, fire department. "We were happy to work with the Dayton Fire Department on this project," Miller says. "The department employs an inspector for both arson and well field violations. So, the department wanted one side of the vehicle to bring the arson message and the other side to relay the well field mission. This 2017 Ford Interceptor was wrapped using Arlon SLX kit for color graphics and 3M IJ680/8518 for the reflective stripes and seals. All items were printed on a Mutoh ValueJet 1324X, laminated using Seal 54 EL and contour cut using a Mutoh ValueCut VC-1300." 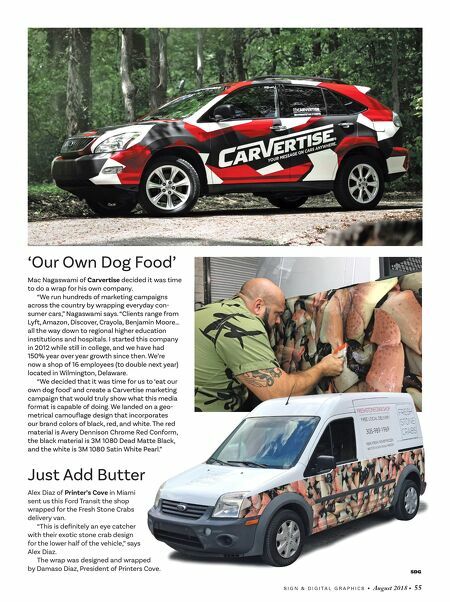 The wrap was designed and fabricated by Brian Barnard and was completed in around 15 hours.